Cherry Ice Pops - Delicious and healthy frozen treats! Ah, ice pops. So many fond memories of ice pops from my childhood. In Ireland, holidays at home usually meant begging Mom for ice pops even when it was lashing rain outside. It didn’t matter the weather, summer meant frozen treats. Back then all I knew was Wibbly, Wobbly, Wonders and Ice-burgers. The recent (unusual) heat wave here had me craving some refreshing so I set out to make SCD-legal treats. I ordered stainless steel ice pop moulds on eBay. I won’t say that I don’t use any plastic any more although I wish that were true. However, I have tried to cut down using it whenever possible. I also wanted to invest in good, durable moulds that would last me a lifetime rather than having to replace them every year. They arrived and I was so happy with them. Barely able to contain our excitement, my daughter and I began to experiment with different flavours the very next day. Cherry ice pops were top of our list! I love cherries. When I was small, we didn’t get cherries very often in Ireland. I sound like I was deprived but it’s the truth. When I spent my first summer in Italy as a teenager, I first tasted cherries from the local market and I was blown away. The flavour, the juiciness. How had I lived without tasting these for so long? The cherry and coconut milk combination is delicious and these are certain perfect for cooling you down on a hot day. 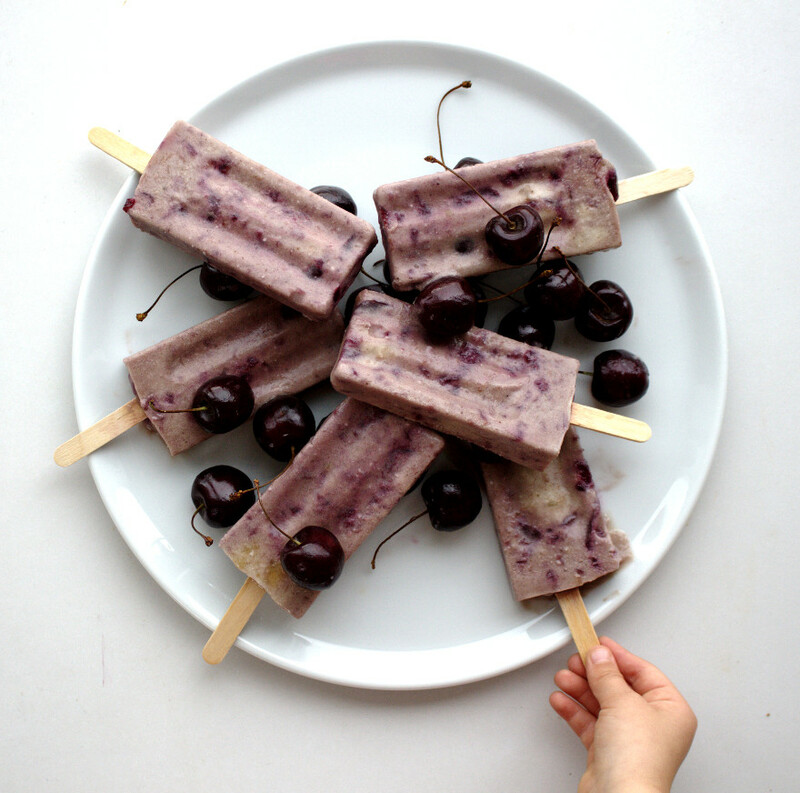 Let’s face it: these cherry ice pops are so yummy you’ll even make them in the winter too! Delicious and healthy cherry ice pops perfect for making with kids. Gluten, grain, dairy and refined sugar-free. Paleo and specific carbohydrate diet (SCD)-friendly. Add the cherries and orange juice to a saucepan and place on a low-medium heat. Cook for 15-20 minutes until the cherries break down, stirring often. Allow mixture to cool in a bowl. Blend the coconut cream with the frozen bananas. Once the cherry mixture has cooled, stir it through the coconut and banana mixture and pour into the moulds. Freeze the pops for one hour first before then adding the wooden ice pop sticks. Continue to freeze for at least 4 hours or 6 hours at best. Enjoy! *You can make coconut cream from refridgerating a can of coconut milk upside overnight. The next morning, turn it right side up and scoop the cream from the top of the can. Reserve the leftovers for smoothies or pancakes.